Lover of home and family, four-legged buddies, writing, sewing, coffee, walking, life! Sheila of Sewchet again sponsored her StitchingSanta, a secret gift exchange. Once more, I signed on, and eagerly gathered sewing goodies for my recipient. Truth be told, however, I was slightly reticent, since after so recently losing my mother, my heart just wasn’t in the holidays this year. I was rather worried that my partner would receive short shrift. I needn’t have worried however, because of the neatest little twist of fate. You see, last year my recipient was a quilter and I am not. What in the world does one give to a quilter? I scrolled through the US participants and discovered, tra-la!, a quilter. I emailed her straight away and she was so kind to respond with a massive list of possibilities that any quilter would love at any time. I purchased or “found” items working almost exclusively from that list, and my recipient Susan, of Desert Sky Quilting,was pleased with everything! Do you know where this is leading? To my 2017 recipient! The very quilter who so kindly helped me out last year! Becky, of Power Tools with Thread, had given me a list of the items I needed to make her Christmas a quilters’ delight. Per her list, I included some Clover wonder clips, a blue disappearing marking pen, some adhesive sandpaper dots, and some quilter’s pins. I also included some items from stash – seam tape, variegated blue thread, and a “deluxe” needle threader, which she loved and needed badly! And a cute little homespun candy cane ornament, which I just couldn’t resist. They all fit into this little handmade fabric bag. Also to be included were two more items from her list which I ordered in plenty of time for delivery. Sadly, the company had a major snafu with their holiday mailings and mine was among the many not delivered in time. I received it Dec 29, the day we returned from California, and I had to wait till after New Year’s Day to get it into the mail. And so Part 2 of her parcel, now dubbed Happy Stitching New Year, is on its way to her at last. Thanks for your patience, Becky, and may 2018 be snafu-free for all of us! Hey Kids, We’re on a Roll Now! The Hudsons! Remember them? They are on my makenine list for this year. And they have been on my cutting table for an embarrassing number of days ….weeks ….months. But, they are finally finished! Everything was set up and ready to go before being covered up! So off we went, and the world’s slowest sewist (oh look, an alliterative rhyme) cut out the pants in short order. So easy! Fronts, backs, pockets, waistband, cuffs. I should have been well on my way at that point, but I needed elastic and cording. My closest fabric store is about 10 minutes away. So how many days did it take for me to complete this task? Seven! The bottom line is, after acquiring the last necessary items, I stepped up to the table and cut out the pants. I carefully marked all the pieces, and pinned the pocket lining to the pockets. Then my life began to cave in, and the Hudsons were cast even further to the background. 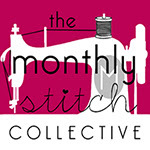 While I wasn’t sewing I began reading my favorite blogs again (not commenting, not posting, just reading). And from time to time, checking my emails. A newsletter from Karen Ball of Did You Make That? waited for me, asking folks what they would like to see her address. You know, problems or issues we may have with sewing. So I spilled my guts and asked for help when the sewing is just too scary to attack. And she used my question in her blog! I took Karen’s advice to allot a short amount of time to sew and when time was up, move away from the machine. Allowing myself to sew in only tiny bits freed up my worries about not accomplishing a damn thing and just see what happens. Well, my Hudson pants happened! And this is roughly how it went. Day 1. Pockets. Pocket 1 – it was perfection! Boy am I good. Pocket 2 – the bloomin’ thing was inside out. Curses, perhaps I’m not Susie Sewist after all. However, after moving the pocket to the proper side, all was well. Day 2. Side and crotch seams. Easy peasy. Day 3. Waistband – hmmm do I really need that cord? What a pain it will be to do all that work, there are two buttonholes and a channel to create. But determined to do it properly, I followed the pattern and my buttonholes are perfect. Next step, attach the waistband to the pants. In so doing, I caught up the pocket in the stitching and with a sigh, began the unpicking process. Guess what? I had run out of bobbin thread! No unpicking required. This project had adverted its own crisis! Another magic moment. Day 4. Attaching the elastic was the next challenge. With elastic in place, I basted using colorful rainbow thread because sheesh, this a lot of black thread on black fabric and my old eyeballs needed a rest. I sewed the bottom edge of waistband to pants, and tried them on once more. This was going to be one comfortable pair of pants. Day 5. First cuff. Next I tackled the final piece of the pants puzzle, the cuffs. First cuff – meh, not bad. That’s all for today. Tomorrow will be the grand finale! Day 6. Second cuff. Can you see the overly pinned cuff waiting for me, just behind the machine? I quickly sewed it up, and took it to the ironing board. Yikes! what happened here? Bunch upon bunch upon bunch. Once again, seam ripper to the rescue, and with only two short segments to sew (or resew, if that’s a word) with fewer pins, the cuff fit over the throat easily, and the job was at last complete. After a good press, I am thoroughly enjoying my new, super comfy, wearable Hudson pants. And the moral of the story? Sewing is a very humbling activity, but sometimes the magic happens. It turns out that my cheapo fabric is a wonderful ponte and my new pants are beyond wearable; they fit perfectly as printed, and are perfectly suitable for public viewing! I love my new Hudsons! Must make more. Many more. Gray, green, blue, red, wild prints. We shall see. And I must find a more dignified method of taking selfies. Next up: the toile for my dotty Farrow Dress, which will be made of this luciousness. Thanks for indulging me, and stitch on, everyone! Hello all. Most of you know that my mother has been living with us and we have watched her slow decline over the last year suddenly become so rapid. Her journey is now over. Mom passed away peacefully August 25, and my heart is broken. It’s still so new, so raw, but I know that time will heal all sorrow….or so they say. However, having lost grandparents, my father and stepmother, stepfather, and stepson, my heart knows that time really doesn’t heal, the pain just moves a bit away from the very forefront allowing us to move ahead. Fortunately, mom was never hospitalized. Hospice workers came to the house to care for her (and us). Her voice weakened until we could barely make out her whispers, but she was aware till the end. She loved to sit on the porch and listen to the birds until she was unable to get out of bed. She also loved ice cream (a lot!) and when her lack of appetite permitted only one or two bites a day, those bites were mint chocolate chip ice cream. My sister and all of my children were able to come from the west coast to visit in her last couple of weeks. Their visits brought her such joy. My husband and I are comforted to have been with her, holding her hands, as she took her last breath. My mother was a little woman, packed with strength, courage, stubbornness, resilience, charisma, compassion, laughter, talent, grace and more love than should have fit into her mini-sized body. She instilled in me a love of nature and music (sadly, not her singing voice), a bit of goofiness, a love of family, unwavering devotion to my children, a love for all people and animals, a need to serve, and a need to create. My father’s mother taught her to sew, and Mama taught me. So as I grieve, I know there is a way to continue her legacy. I’ll pursue more charitable giving and work, speak up for those who have no voice, love my family with abandon, and I will sew. Remembering her fastidious garment sewing over the years will remain an inspiration to me. And in her honor, after I finish a work-in-progress, my first new project will involve dots! Why dots? Just have a look. Dots for birthday baking…. …and dots (might they be red?) in the park with a gorgeous coat. Perhaps a need to conceal her secret prompted me to edit out the reason for mama’s silly expression – her hand is deep in a bag of potato chips! Methinks that as I’m in her belly in this photo, she may have contributed to my love of salty snacks. Thanks Mom. So now I must begin to pick up the pieces. I will keep her always in my heart, and I’ll cry. But I’ll carry on. As she did through many challenges and many losses. As we all must.